I am a pretty local dog. I don’t travel much. I have been to Cape Hatteras but outside of that I really don’t stray to far from home. The reason for this is that I don’t like to fly. I love to ride in a car but flying is not fun. I know there are some people who don’t really like to fly but it is way worse for a dog. We have to ride in these little boxes in the cargo hold. It is very noisy down there and you can’t even get a window seat and you though coach was bad. Basically it is dark noisy, very scary and you get tossed around by those baggage handlers. For this reason I don’t travel much. The other day I mentioned that the I liked the 1st half of the movie Cujo. I was looking through some pictures my A took in Bonaire and I found the dog that played Cujo. Yup the dog that played Cujo is happily retired in Bonaire. My A was only able to get a picture of him from the car because he was not sure what would happen if he got out. My A ended up driving around the block 4 times to get a good shot of Cujo. 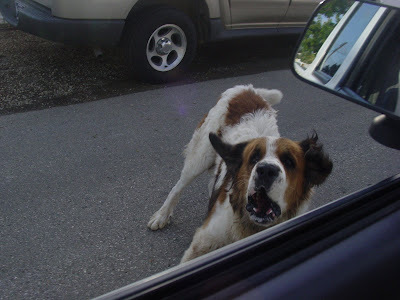 Cujo really likes chasing cars, when you drive past his house he comes running out barking and drooling. It is quite an intimidating sight to see him at full speed with saliva flying everywhere. I wish I could look that scary. I have been working on my scary face but I have not mastered it yet. You can really tell that Cujo had some acting classes because his scary face is awesome. If you are ever in Bonaire be sure to stop by and say Hi to Cujo in between dives. Oh yeah and check out the mixed Grill for 2 Casablanca. That thing is like 2 steaks, 2 whole chickens, a ton a sausages, some pork chops, some ribs. I think it costs $22 but there is at least $30 worth of meat in there. You really need to check it out of you get the chance. If you can finish it on your own I will guarantee you a Stephen award.